I met Trang, a delightful young woman, in the nearby tourist town of Hoi An, while I was visiting a disabled women’s workshop run by an Australian charitable organization. I was struck first by Trang’s glorious smile and, secondly, by her extremely unusual “gait,” or mode of walking. As a little girl, Trang contracted polio, which paralyzed muscles in both of her hips and also those that control her left knee and ankle. 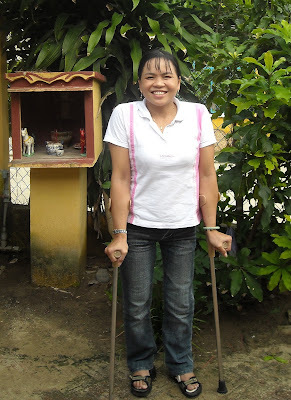 Trang struggled to compensate for this extensive paralysis by using one hand to brace her left knee and by throwing her body vigorously from side to side with each step. That's an incredibly energy–intensive way to get about and, understandably, Trang was developing severe back pain. Clearly, her days of being able to ambulate in such an arduous fashion were limited. I thought Trang could benefit from a brace, though I’d never seen one designed to address her specific situation. With the kind assistance and financial support of the Lifestart organization, we took Trang to a local orthotic workshop. There, with the collaboration of a local orthopedic surgeon who discovered that Trang also lacked the socket portion of her left hip joint and a Swiss orthotist who conceived of the basic brace design, we had Trang fitted out with a special “ischial-weight-bearing orthosis.” Trang took the multiple trial fittings and painful adaptation to wearing such a cumbersome contraption with grace and equanimity. She quickly mastered the technique of walking erect with the brace and her two new crutches, as well as the back exercises I taught her. What a delightful patient and sweet-tempered human being! Trang was delighted with having received her first artistic “commission” and hopes that she can find other organizations that would be interested in doing similar projects. 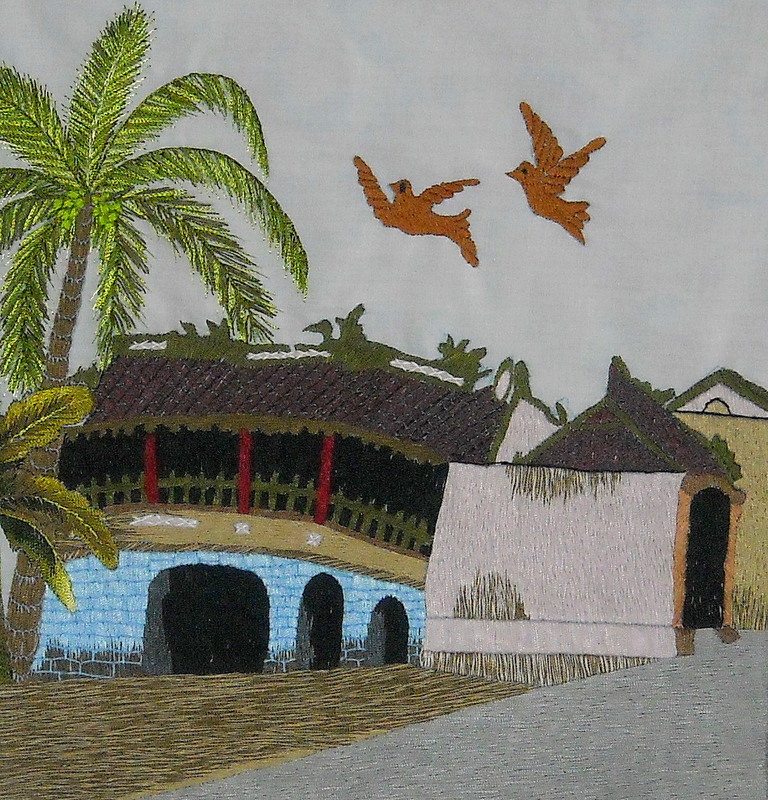 If you or someone you know might be interested in purchasing custom embroidery by Trang for your fund-raising efforts (or any other reason, for that matter), you can e-mail me at steadyfootsteps@yahoo.com and I’d be happy to help you connect with Trang. Sometimes we can all feel overwhelmed by the effects of the global market place. Small, locally based businesses find it difficult, if not impossible, to compete with gargantuan corporations that utilize sweat shop labor and ship goods by the container load. But we can tilt the balance just a bit when, to the magic of instantaneous electronic communication and rapid air travel, we add a measure of personal connection and compassion. The 29 pillow slips that Trang created for the Virginia Beach Friends Meeting crossed the Pacific in a suitcase carried by a Wheelchairs for Humanity volunteer. 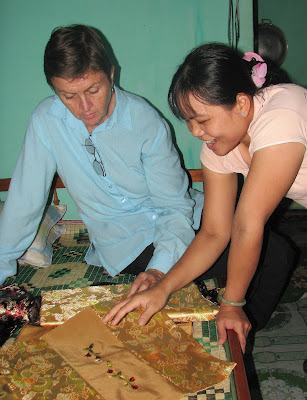 All the proceeds from the sales of Trang’s pillowcases will go to Trang and to support the work of Steady Footsteps. Now that’s global trade that we can happily support! 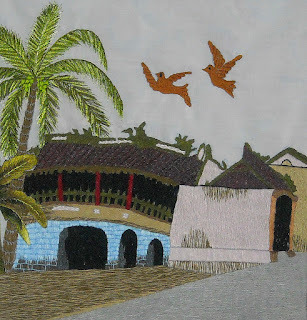 UPDATE: Check out Trang's newest creations on-line at the Da Nang Artists Company website!